I did not intend to be away from this space for this long without stopping by to say hello but somehow the usual one week turned into two and those quickly turned into three. Suffice to say work has been busy, I have been away, first in Italy and then in Germany, I have been trying to get on top of my never-ending list of final moving and flat-related errands and some recipes have been taking longer to test than expected (white chocolate miso brownies, I am looking at you!). These muffins were inspired by a rosy tart I am working on and that will be shared on food& in a few weeks. While Monday mornings are as good a time as any to swap weekend indulgences like buttery croissants or pancakes doused in maple syrup for porridge, there is nothing like a homemade pastry and a good cup of coffee to take the edge off the start to another busy week at work. Dried rose petals are not exactly pantry staples but together with some raspberries, chopped almonds and a pinch of ground cardamom they do make for rather special muffins. If you also have some salted butter and some rose petal jam, even better – you can toast your muffins, slather some of that salty butter on top and finish it with a heaping spoon of that fragrant jam. Sitting on the balcony, milky coffee in your hand and munching your way through one of these muffins and suddenly it being another day at work with the weekend still impossibly far away does not feel all that bad. If you follow me on instagram or twitter you may have already spotted this, if not, I have just started contributing on food& – together with the rosy tart, I will be sharing a series of recipes on their site, both old favourites and new ones. The first one, for carrot and mace financiers has just gone online – you can click here to see the recipe and read the post. Note: I am the first one to be worried about a dish tasting soapy (and thus unpleasant) as soon as I read the words rose blossom water, rose petals or rose petal jam on a menu or in a list of ingredients. But my friend Sarah gave me the idea to pair rose with something acidic to allow the floral flavour of rose to shine without any soapy undertones. Rose and raspberry is a flavour combination that immediately makes sense once you try it – raspberries themselves have a complex flavour verging on floral and a slight tartness that is perfect for cutting through any soapy notes from the rose petals. Together with ground cardamom and a handful of pistachios and almonds, rose petals and raspberries give a classical spelt muffin recipe a Middle Eastern touch, making your muffins that bit more interesting and delicious than a standard blueberry muffin. 1. Preheat the oven to 180 degrees Celsius. Grease a 12 hole medium size muffin tin. 2. In a bowl whisk together the flour with the chopped nuts, ground rose buds, sugar, baking powder, baking soda, pinch of salt and ground cardamom. Add the raspberries and stir to distribute evenly in the flour mixture. 3. In a jug mix the yoghurt with the milk, egg and melted butter. 4. Pour the wet ingredients over the dry ingredients and briefly stir together until just combined. 5. Divide the batter between the muffin holes and place in the oven for ca. 25 minutes or until just starting to colour and a toothpick inserted into the middle of the muffins comes out clean. 6. Let muffins cool in their tins for ca. 5 to 10 minutes before carefully removing the muffins from their tins to cool completely. These muffins will keep for a couple of days if stored somewhere cool and dry. Combining the raspberry and rose is a great idea. Have the same problem with lavender, possibility of soapiness and pairing with something else solves the dilemma and actually gives a lovely complex flavor.. Beautiful muffins. Thank you and yes, so true regarding lavender as well (and rosemary too for me)! Although I don’t seem to have the same problem with orange blossom water! These look delicious Sophia! 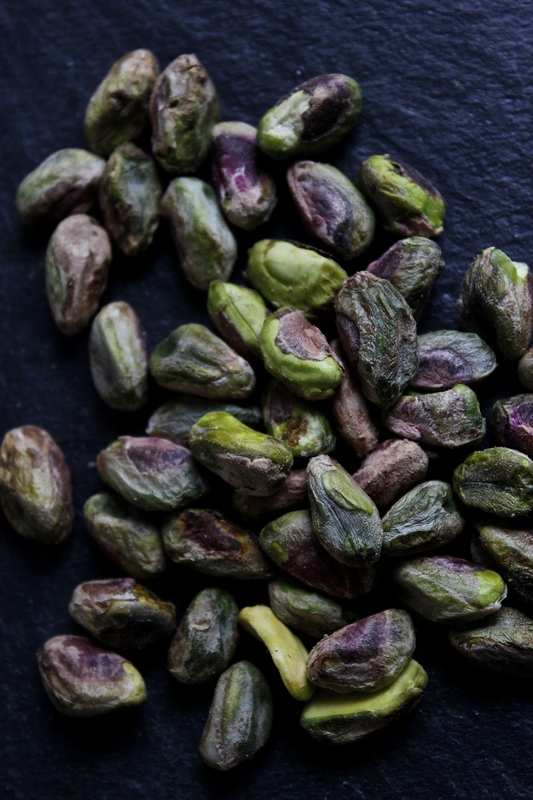 The pistachios and almonds sound wonderful!